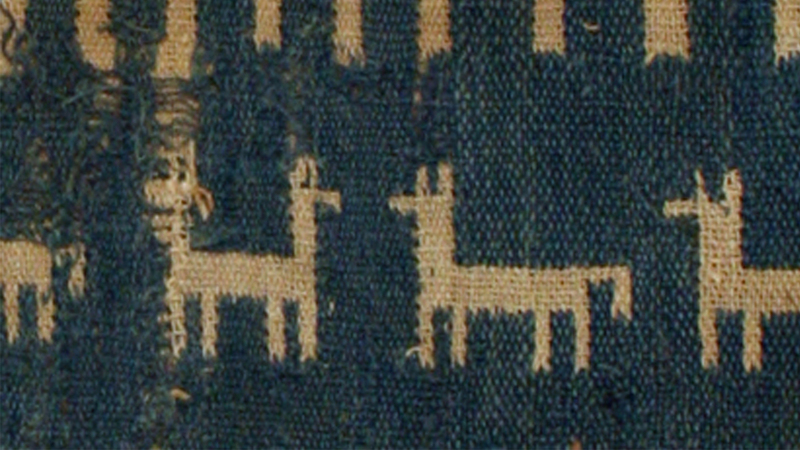 Doublecloth Fragments with Llamas and Herders. Central Andes. Chancay. Late Intermediate, ca. 1000-1470 AD. Camelid fiber, cotton. Ex coll. C. Clay and Virginia Aldridge. Emory University student Rebecca Levitan and Georgia State University student Arden Davis worked with consulting textile conservator Patricia Ewer to bathe fragments of an Andean doublecloth textile. The use of a surfactant facilitated the removal of centuries of dirt and grime, making the ancient textile brighter and more flexible. This is part of the Science of Art series, which explores concepts taught in Emory's general chemistry classes through case studies featuring objects and conservation projects from the Carlos Museum.